Cabbagetown. Photo by <a href="http://www.flickr.com/photos/gezenvizor/11506672483/in/[email protected]/">gezenvizor</a> from the <a href="http://www.flickr.com/groups/torontoist">Torontoist Flickr Pool</a>. Leslie Spit. Photo by <a href="http://www.flickr.com/photos/-evidence-/11504526854/in/[email protected]/">~EvidencE~</a> from the <a href="http://www.flickr.com/groups/torontoist">Torontoist Flickr Pool</a>. The Leslie Street Spit. Photo by <a href="http://www.flickr.com/photos/-evidence-/11506374086/in/[email protected]/">~EvidencE~</a> from the <a href="http://www.flickr.com/groups/torontoist">Torontoist Flickr Pool</a>. Photo by <a href="http://www.flickr.com/photos/hoomanziya/11506294494/in/[email protected]/">Hooman Ziya</a> from the <a href="http://www.flickr.com/groups/torontoist">Torontoist Flickr Pool</a>. The Beach. Photo by <a href="http://www.flickr.com/photos/[email protected]/11504663893/in/[email protected]/">Pyxus9</a> from the <a href="http://www.flickr.com/groups/torontoist">Torontoist Flickr Pool</a>. Photo by <a href="http://www.flickr.com/photos/timfolkins/11501561026/in/[email protected]/">+Tim+</a> from the <a href="http://www.flickr.com/groups/torontoist">Torontoist Flickr Pool</a>. Photo by <a href="http://www.flickr.com/photos/jonathanp77/11492349423/in/[email protected]/">jonathan ponce</a> from the <a href="http://www.flickr.com/groups/torontoist">Torontoist Flickr Pool</a>. Photo by jonathan ponce from the Torontoist Flickr Pool. Photo by <a href="http://www.flickr.com/photos/hyshoots/11483647656/in/[email protected]/">Howard Yang</a> from the <a href="http://www.flickr.com/groups/torontoist">Torontoist Flickr Pool</a>. Sidestreet near Bathurst and Atkinson. Photo by Mark Kay/Torontoist. Wychcrest Avenue, near Dupont and Ossington. Photo by Nancy Paiva/Torontoist. St. James Park. Photo by Nancy Paiva/Torontoist. A peak of 300,000 customers without power; much of the TTC diverted, delayed, or shut down; split trees; live wires hanging over residential streets. It’s one of the most damaging storms the city has seen in years: Toronto Hydro called it “catastrophic” and warns that it could take days yet for power to be restored to all those who lost it. All TDSB and TCDSB sites, including child care centres, are closed on Monday and Tuesday. For the latest on power repairs, check Toronto Hydro’s outage map or its Twitter feed. Call (416) 542-8000 to report downed wires, but be advised that lines are still very busy. As of 5 p.m. on Monday “less than” 200,000 customers (which works out to about 500,000 individuals) were without power. 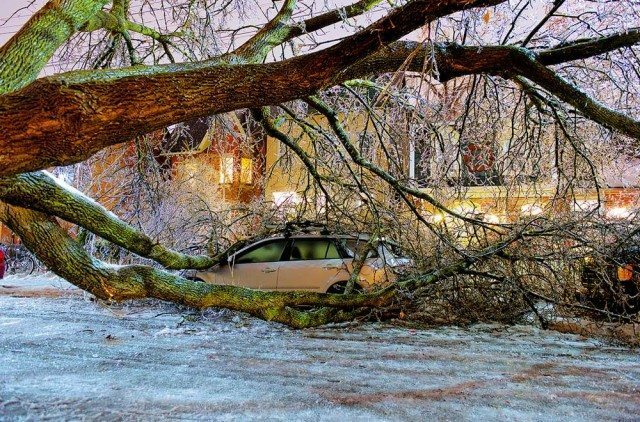 Toronto Hydro has advised that because of extensive damage caused by trees coming down on power lines, some locations may not be back up until the weekend, though they still hope to have the majority restored by Wednesday. The Sheppard subway line remains closed due to power issues; 13 replacement shuttle buses are running. Service on the following bus routes has been suspended due to road conditions: 28 Davisville, 82 Rosedale, 97A Yonge, and 162 Lawrence-Donway.